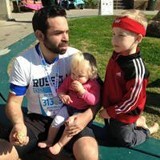 Last Sunday I ran the Central Coast half marathon. So I’ve decided to run a marathon. Why… it kind of just happened. Like any good story there are three main characters: the hero, the victim and the villain.